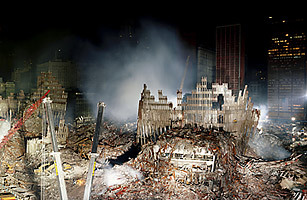 A panorama of Ground Zero looking northeast across the site. The image was assembled from multiple frames taken from the ninth floor of the World Financial Center. The rebuilding of the World Trade Center site has been perhaps the most complicated  and important  construction project in American history. Never before have so many moving parts been required to fit together  above, around and under train lines that have continued to run through the site. Never before have so many government agencies and actors  there have been eight governors of New York and New Jersey since the attacks  been involved in a single project. And never before have so many citizens felt such a deep personal connection to a site and taken such an active role in planning its future. As a result, the redevelopment of the site has not been as smooth or quick as anyone would have liked. But today, the progress at the site is unmistakable  and that's incredibly heartening. A tower that will rise 1,776 ft. is now 48 stories above ground. Thousands of construction workers are on-site night and day, building not only new skyscrapers but also an inspiring memorial, which we will open on the 10th anniversary of 9/11. The rebuilding of the site is an affirmation of the American spirit  of our faith in our future and in our freedoms. The engineers and hard hats at the World Trade Center site recognize that they are working on more than just a construction job. They are rebuilding a civic and commercial center that symbolizes the openness and opportunity that have always defined our city. And most important, they are helping our country fulfill a sacred obligation to those we lost, honoring their memory  and our nation's principles and values  with every steel beam that swings into place. See pictures of the evolution of Ground Zero.